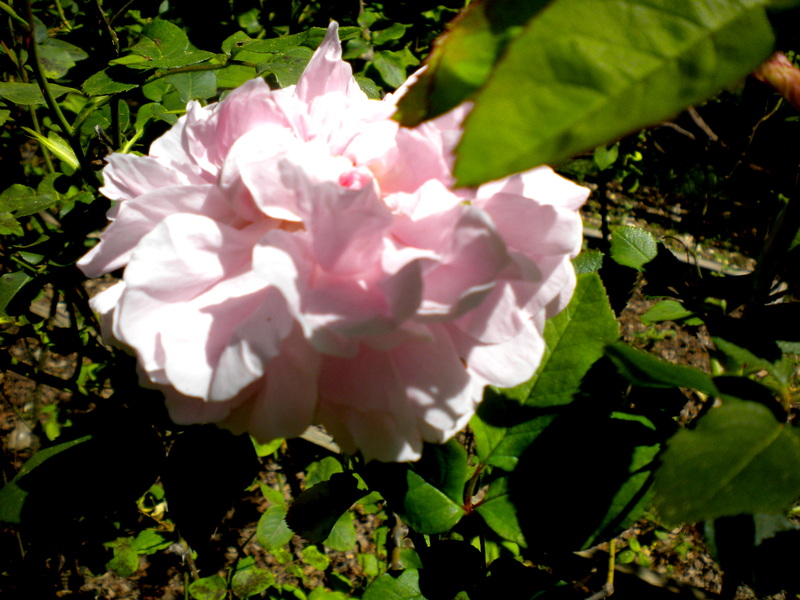 It was when we lived in Ferndale in northern California that I REALLY fell in love with old fashioned roses. They seemed just the ticket in that National Monument of a Victorian village. And it was there, in fact, that my Inner Gardener came full bloom. I attribute it in part to the genetic and personal influence of Grandma Marie who was the personification of the best of what gardening is all about. I’ve written about our sweet cottage setting in Long Beach, California and how I grew up in the prettiest yard in town. It was further cemented in a trip to Minnesota in the 70’s when we visited the niece of my Grandpa Johan – Alida Olson. I was staggered. Alida’s garden was the epitome of the English (call it Norwegian here) Country Garden, with it’s deep, undulating beds all sumptuously exploding with a horticulturist’s dream. So when my cousin Marlene told me about her inclusion so many years later in a book called “Growing Home – Stories of Ethnic Gardening” by University of Minnesota Press, I ordered it immediately. Alida has a whole chapter called “A Fairy Cottage” dedicated to her expertise, and featuring a picture of her unbelievable Polygonum orientale – or as it’s racily called “love-lies-a-bleeding” or sometimes “kiss-me-over-the-garden-gate”. Hard acts to follow, those two. So in Ferndale when the mania began to overtake me, I immediately joined the local garden club and spent some time sitting at the feet of the no-nonsense, backed by years of digging and planting, ladies of the northern coast. 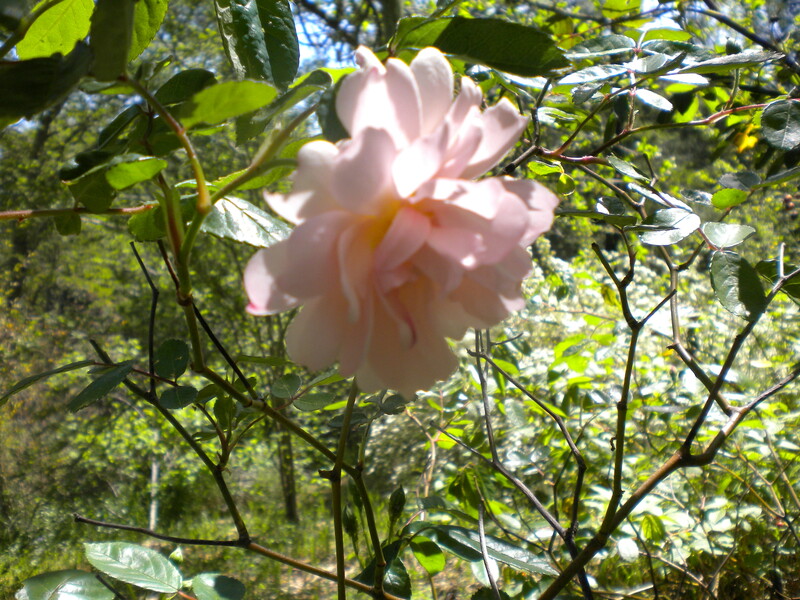 Then still hungry for more, I entered the Master Gardener Program, and finally hooked up with a handful of local old rose enthusiasts and we started the first Humboldt County branch of the Heritage Rose Society. It was there that I met Cindy Graebner, who owned a small nursery on Fickle Hill in Arcata where she propagated and sold old roses. It is to Cindy that I owe the following and I’m passing it on. 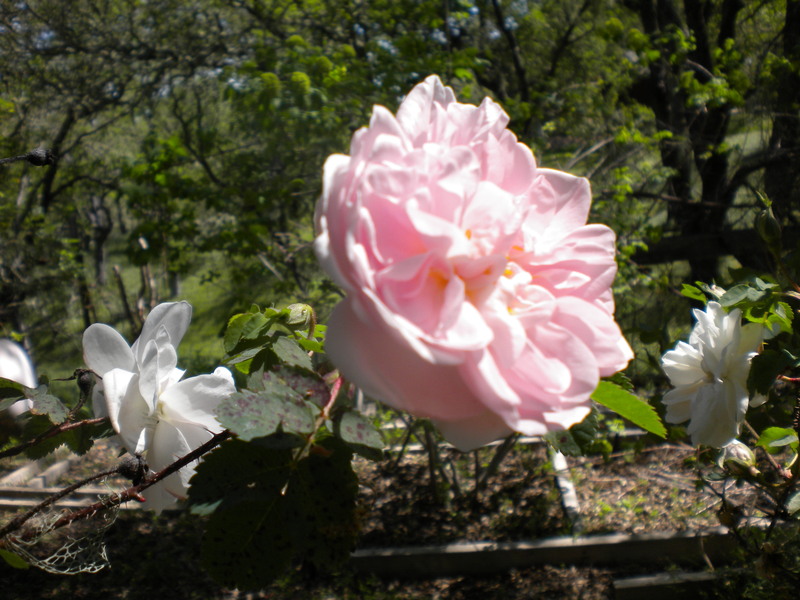 As a boost before the first full blooms and as a tonic after they have delivered: Feed each rose a mixture of one gallon good compost (organic is best), one gallon of alfalfa meal, 1/3 cup Epson salts, handful of rose food. I order alfalfa meal from the local feed store as they don’t ordinarily stock it, however alfalfa pellets will do just fine. Pellets are a bit unsightly and don’t break down as fast and if you are meticulous like my cousin Maryanne, you just might have your husband cut them all up with scissors! I’m not kidding. She did! When I first used the Cocktail I dutifully mixed up each rose’s batch individually, but now I realize it is just as effective and easier to go through the garden and sprinkle the rose food on each, then the Epson salts, then the alfalfa (leaving them conveniently UNDER the compost if you have pellets) and ending with a cover of compost. After the early explosion of the Lady Dorothea Banks, my garden is just beginning to show multitudes of buds and a few first flowerings. Cottage Rose is a David Austin English shrub. This is a modern and not a true heirloom, but the Austin Roses are usually included with the “old roses” because they were created to reflect the best of the old and the new and definitely have the blowsy in some cases or the tight full petals of heirlooms. Cornelia sits under the bird’s peach tree next to her smaller Hybrid Musk sister, Belinda. 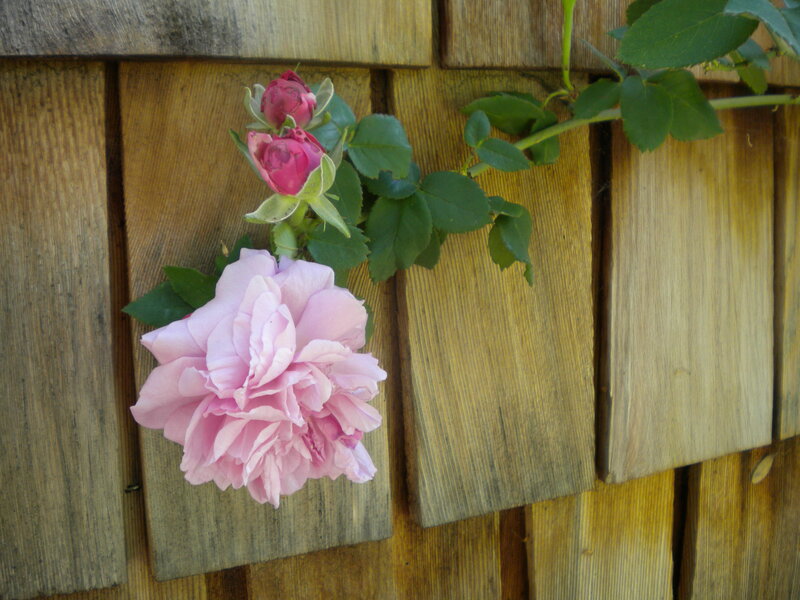 The Bourbon rose, Louise Odier grows flowers all along her arching canes and because she keeps flinging them over the fence, the deer come into some munching. But she’s a real trooper and keeps going into autumn. These are the first. More to come! I will attest to how great your rose cocktail is, as I used it in Az., not only on my roses, but all other plants. I never had such great blooms as I did with the cocktail! For that I really thank you. And yes my husband sat and cut up 25lbs. of alfalfa for me! Keep on writing, you have such a wide variety of subjects, each being so interesting.